She was born in 1992, Bratsk, Irkutsk Region. In 2011 she graduated at the Bratsk Music College (class of Andrei Bazhin, since 2009 - class of Viktor Zverev) and enrolled the Krasnoyarsk State Academy of Music and Theatre (class of Honored Artist of Russia, Professor Alexander Mikheev). In 2016 she graduated the Higher School of Music and Theatre (Rostock, Germany) and the Krasnoyarsk State Institute of Arts (Class of Honored Artist of Russia, Professor Alexander Mikheev). 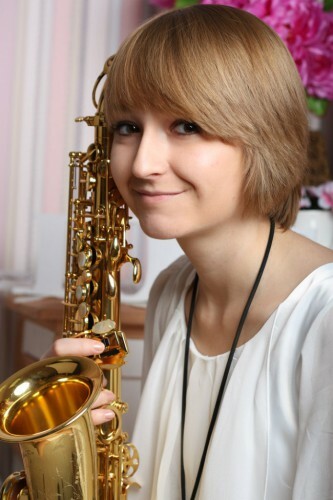 She is currently the assistant lecturer at the department of wind and percussion instruments of the same teacher. 2012 - the laureate of the II Prize at the Interregional Tulunina Festival-Competition of Young Performers (Krasnoyarsk). 2014 - the winner of International Competition «Naidal-2014» (Ulan-Ude). The diploma holder of X Krasnoyarsk International Music and Theatre Competition «Hope-2014» (Krasnoyarsk). The laureate of the III Prize at the International Competition-Festival «Siberian Music Assemblies-2014» (Novosibirsk). The diploma holder of XIII Youth Delphic Games of Russia and I European Open Delphic Games (Volgograd). 2015 - the winner of All-Russian Competition «Young Talents of Russia» (Moscow). 2017 - the laureate of the II Prize at the International Karamanov Music Competition (Kaliningrad). She was awarded with the Mayor of Bratsk Prize. She has participated in master classes with Martin Baeza de Rubio, Arno Bornkamp, Julien Petit, Jean Denis Michat, Daniel Gauthier, Christian Wirth, Andrei Bolshiyanov and Margarita Shaposhnikova. The member of St. Petersburg Music House programs since 2014.